Are you not able to see your website in the Google search results? Here is the solution of your problem in 3 easy steps. Go through the below article and know how to submit your newly launched website to Google Search Index. Many of the newbies in blogging when they launch their new website or blog get very confused when they are not able to find their website in Google search results. For, example if you have launched a website www.example.com and you search it in the Google with its domain name even and even then you are not able locate it anywhere in the search results, it is obvious that you will be worried. But the fact is that there is nothing to worry. It is just that your website is not in the Google search index and hence the search engine is unable to track it. So, if you are facing the same problem i.e. unable to locate your website in the Google search engine, here is the solution for you. All you have to do is to submit your website to the Google search index and below is the step by step tutorial to do so. How to submit your website to Google Search Index? Step 1: Open a browser on your PC or laptop. Enter the web address: www.google.com/addurl in the URL box of your browser (as shown in the image below) and press enter. Step 2: You will be redirected to the page shown in the below screenshot where you have to enter your website (If you are not logged in with your Google account, you will be taken to the log in page and then the page below). 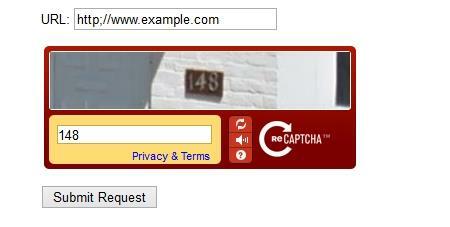 Now, enter the complete address of your newly launched blog or website like http://www.example.com and enter the CAPTCHA correctly in the next text box as shown in the image below. Step 3: Make sure you have entered your site URL and CAPTCHA correctly and click on 'Submit request' button below the verification code. After clicking on Submit request, you will be taken to the following page showing that your request has been sent and will be processed shortly. You are all done. Now wait for next few days (72 hours approximately) and search for your website URL again in the Google search bar and you should find your website on the top with some subcategories like the professional websites. 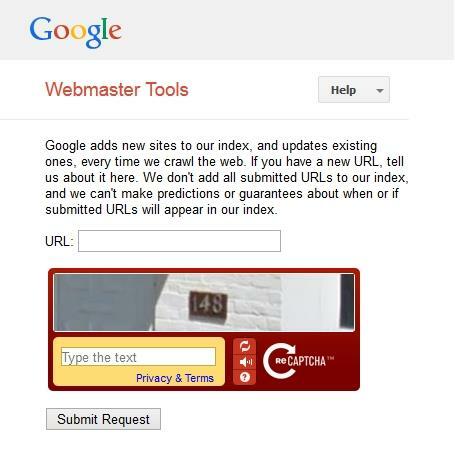 This was the 3 step tutorial on how to submit your website to the Google Search Engine index. In the above process, make sure you enter all the text entities correctly and then submit your request. If you need any sort of help regarding this tutorial, feel free to contact me via the response box below. I will be more happy than happy to help you solve your queries. Read Why your blog suddenly lost traffic from Google? First we need to login with our gmail account. Oh yeah. Thanks for the information. I had forgotten to mention that. Updated the same in the second step. Does it accept the totally newly launched the blog with just one or two posts? Or is there any need to have sufficient number of posts on your blog to be able to submit your blog? There is no condition from Google to have sufficient number of posts on your blog to be able to submit your website or blog. But there is also another way to get your website indexed on Google fast. After all this above steps. Just click on Crawl Tab. From drop down Click on Fetch as Google. Just Click on Fetch and Render. Wait for 24 hours and Google will index your website in Search result. I know this is not the procedure to submit the website as author told in article. But this method also does the same job. You do not have to wait a long time to see your website in Google search by this method.